Ancient Douglas Tartan Ribbon is available to buy in 10mm (3/8"), 16mm (5/8"), 25mm (1") and 38mm (1½") widths, on full 25 metre (approx 27½ yard) reels. The Ancient Douglas Tartan Ribbon sold by tartan-ribbon.com is top quality, authentic Scottish tartan ribbon as certified by the Scottish Tartans Authority. 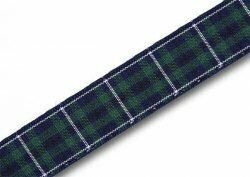 The Ancient Douglas Tartan Ribbon has a fairly light blue and green undercheck, with a white overcheck. 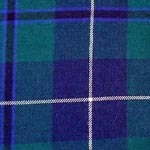 Traditionally, "ancient" variants of clan tartans are lighter or more subdued in colour than the main clan tartan. Modern Douglas Tartan Ribbon (darker blue) is also available exclusively from us, in 16mm width only.